Digital Forsyth | Forsyth County Centennial Parade on North Main Street, 1949. 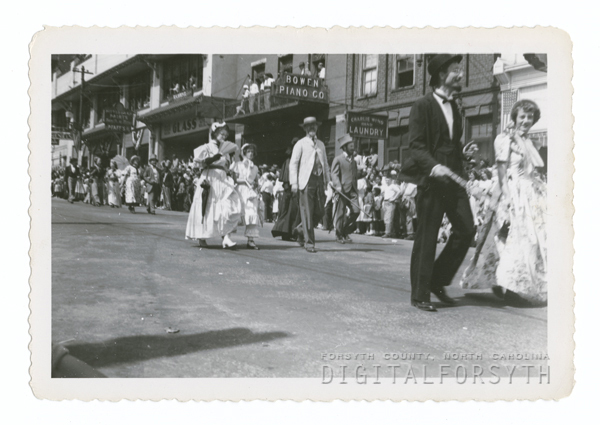 Home › Photos › Forsyth County Centennial Parade on North Main Street, 1949. Forsyth County Centennial Parade on North Main Street, 1949. Photograph shows the parade in the 200 block of North Main Street with people in costumes walking down the street. Mama and Daddy First Couple on the right. O.M. and Suzanne Teague. Thank you for the identification. I’ll add their names to the photo database.